The field of conservation continuously evolves as new technologies are introduced and assimilated into to a conservator's toolkit. From incorporating lasers to clean stone, metal, or wood to modeling painting cleaning after gecko feet; the field of conservation benefits greatly from innovation and technique development. Contrarily, conservation is also a very old field and many techniques and tools that were used hundreds of years ago are still in rotation today. The Gilding Department is one such department where modern innovations are incorporated, however little has changed in regard to materials and techniques in several hundred years. If you were to walk into the Gilding Department, you would see rows of wooden-handled tools meticulously lined up. 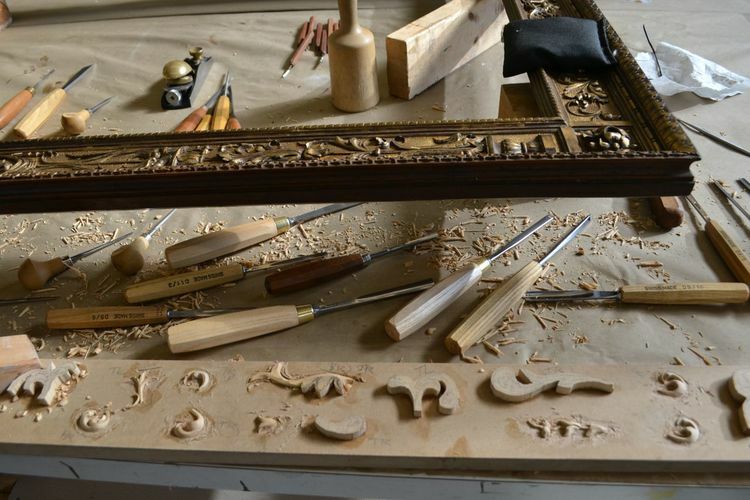 Each tool has a specific function and the conservators very much enjoy educating our clients and guests about why the size, shape, or weight of one tool makes it perfect for executing the fine details needed for repairing a gilded frame or piece of gilded furniture. So when Senior Conservator of Frames and Gilding, Josh McCauley, showed us a lethal-looking set of tools that would make Captain Hook jealous, we had to know more about them. The hooks depicted above are gesso carving chisels and they are responsible for much of the ornate detailing you see on gilded frames. While larger portions of detailing can be carved from wood or cast from molds, gesso carving chisels are responsible for creating depth and dimensionality within the decorative elements. After the carved or cast materials are prepared, the conservators will then apply layers of gesso in order to create an adequate support for applying gold leaf. It is at this stage where they will use the gesso carving hooks to add more detail to the decorative elements. Some hooks might be used to create cross-hatching, some might be used to create beading, and some might be used to deepen the relief on the carved ornamentation to accentuate elements of the design. In the images above, chisels were used to deepen the contrast between the floral element and the ground. They were also used to create the creases and indentations in the leaves which added dimensionality to the ornamentation on the frame. While conservation techniques are evolving with the times, the Gilding Department has found that patience is a key component that proves timeless.